There's no need to choose between these two favorites! Enjoy 12 Classic Cinnamon Rolls with icing and 6 gooey Nutty Sticky Buns. Ready to heat and eat,they can't be beat. There's no need to choose between these two favorites! 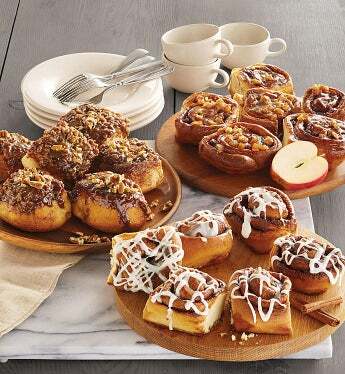 Enjoy 12 Classic Cinnamon Rolls with icing and 6 gooey Nutty Sticky Buns. ready to heat and eat, they can't be beat.